eCite - Glycaemic control in type 2 diabetes: what is the target? 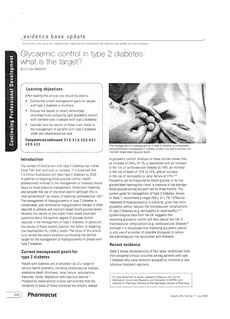 Glycaemic control in type 2 diabetes: what is the target? The number of Australians with type 2 diabetes has tripled since 1981 and continues to increase. It is projected that 1.6million Australians will have type 2 diabetes by 2030. 1 In addition to targeting blood glucose control, health professionals involved in the management of diabetes should focus on blood pressure management. cholesterol lowering and consider the use of low-dose aspirin (although this is nowcontentiousj" as means of reducing cardiovascular risk.' The management of hyperglycaemia in type 2 diabetes is complicated, and combination hypoglycaemic therapy is often required to achieve and maintain target blood glucose levels. Recently the results of two major trials raised important questions about the optimal degree of glucose control required in the management of type2 diabetes. In particular, the results of these studies question the safety of targeting low haemoglobin Al c (HbA1cllevels. The focus of this article is to review the recent evidence surrounding the optimal target for the management of hyperglycaemia in people with type 2 diabetes.